With only four games left to play for, Bengaluru are a just a point behind leaders Mohun Bagan, having played two games lesser. The Kolkata side, who conceded at the death in a 2-2 draw away to Shillong Lajong on Tuesday, have now picked up just one point their last three games. While a win against DSK Shivajians would send the Blues two points clear at the top with a game in hand, the gaffer believes his side is well prepared for the challenge. DSK Shivajians have an enviable task at hand of plugging spokes into the run and inevitably the visitors’ will go all out to take another step closer to win their second Hero I-League trophy after claiming it in their debut season in 2013-14. DSK Shivajians have done well winning three of the six matches played at the Balewadi Sports Complex Stadium so far including the momentary wins against Kingfisher East Bengal and Sporting Clube de Goa in their last two matches played. “We’re approaching the last two or three weeks of the season and we’ve got a big ten days in front of us. We play DSK then East Bengal and Salgaocar but we can only plan for the next game which is against DSK and we’ve done our homework and we’re well prepared,” said Westwood after the Blues’ training session on Tuesday. Bengaluru FC have quietly been going on about their business this season. Ashley Westwood's boys are within touching distance of the league leaders and they have already started to sense their second Hero I-League trophy in three years. Young Daniel Lalhlimpuia turned up with the winner against Mumbai FC on Saturday, going to show the kind of depth Bengaluru has. The win also marked the return of Eugeneson Lyngdoh from injury and the midfielder showed more than just a few glimpses of what he brings to the team. 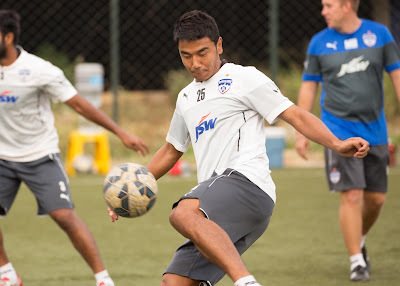 On the injury front, skipper Sunil Chhetri could be in the reckoning after missing out on the Mumbai FC game with a sore groin. “We've done our work and the lads are in good form. We're hopeful of having a few more bodies back on the pitch for this game and a few more selection problems which is what you want at this stage of the season,” opined Westwood. The last fixture of round 15 will be telecast live on Ten 2 at 7:05 PM.